When starting a cleaning business it is important to be aware of a few issues before you start. There are many benefits to a cleaning business and some pitfalls one should know about as well. We will start with the benefits of starting and running your own cleaning business. High demand and frequency of re-servicing. Good security for those that are in demand. Excellent profit to start up cost ratio. A good self sufficiency/ empowerment engine. Scalability is wide and deep. Professionally cleaning has been (and as far as we can see) will be in high demand. The days of robots cleaning effectively are still quite far off- apparently. Outside of that high-tech development, it's all human powered cleaning. People that are willing to do the work very few others have time for or a desire to do, will always be in demand. One great aspect of a cleaning start up, is the high rate of return cleanings. This makes landing a job exponentially high in returns on effort. Since once you land a cleaning job, you will most likely be going back (on average with our system) more than a hundred times or more, it is a very high profit to energy output ratio. 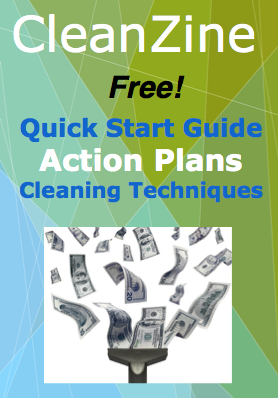 If you spend 10 cents and ten minutes of your time landing a cleaning job that could return over 5k a year in profits. Think about that! With many service professions, you need to have a new client every day (or many times a day) to get the same profitability that just one client in professional cleaning gets you. Starting a cleaning business has high profitability built in! You are in charge of your cleaning business. you have a serious amount of input in what goes down in regards to you financial future. There is no-one over you, holding you back or stopping your financial growth. As long as you make your clients happy and provide the best service possible, you will not only be in high demand, but you will create your own financial security for the future as well. The income potential is as high as you want to take it. You can stay small, lean and mean, just cleaning by yourself or with a partner. OR you can grow it as big as you want by phasing in crews and expanding your reach and profits. A cleaning service business has very high scalability. It can be a part time college student job or a billion dollar cleaning service empire! J.O.B. (Just over broke). Obviously you are not completely satisfied in your job or you would not be here, looking into the very scary world of service oriented entrepreneurialism. You want more than you are ever going to get out of a job and you know that being self employed can bring the kind of respect and meaning to your life that you want for yourself. That is a noble and worthwhile pursuit and we are here to help you out! Bring more pleasure and meaning to your life by starting a cleaning business. Sound silly? It worked for us! What are some of the limitations of starting a cleaning business? It can be a solitary existence at first. It is very physically demanding work. Not ambitious enough in community status for some people. May be hard to scale in small towns. These limitations should be considered when contemplating starting a cleaning business. A career in professional cleaning is not for everyone, but it is a great fit for many people.